In 1995 John Elkington introduced the idea of the triple bottom line. His company, a consulting firm called SustainAbility, suggested that companies support and measure three different bottom lines that would promote socially equitable, environmentally friendly and economically viable solutions to business. 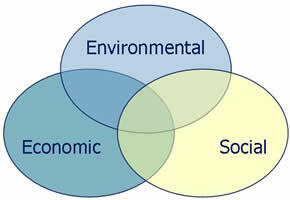 The model shows each element – society, environment, economy – as circles interlocked with sustainability at the heart. Although Elkington was the first to coin the phrase “triple bottom line”, I would argue that few of today’s young workers have heard of Elkington or the 3BL principles he and his company promoted. I would also argue that many young American workers are unfamiliar with the fact that the triple bottom line is the UN’s dominate approach to assessing the full cost of the public sector accounts, or that 3BL standards are used to measure human capital, natural capital and ecological footprints of companies in the UN. In fact, though this measurement is ubiquitous in progressive, globally-minded circles; there is little room or reason for the triple bottom line to be discussed during most job interviews. Recent graduates are usually entry-level workers, not major decision makers, and questioning a new employee’s commitment to their communities or the planet could generally be seen as stepping outside the boundaries of professionalism and relevance. However, many business leaders don’t realize that the values of the triple bottom line are ingrained within many of today’s young workers. Briefly before Elkington introduced the three P’s (people, profit and planet) to the business world, Disney introduced America’s children to Recycle Rex and the three R’s (recycle, reduce, reuse). This catchy jingle was used in elementary schools across the nation to teach children about pollution and other problems caused by excessive waste and irresponsible consumption. Twenty years later, these children are entering America’s work force as the most environmentally-conscious generation in the nation’s history. Predating both Recycle Rex and the Triple Bottom Line was Captain Planet, a show that vilified corporations with irresponsible practices and empowered global youth to work together to save the planet. Movies like Fern Gully: The Last Rainforest and The Rescuers Down Under highlighted the ecological relationship between human consumption and habitat destruction. In summary, the children of the 90s were exposed to the same types of global threats that inspired Elkington to consult businesses to alter their profit models. In addition to an innate urge to live and work in environmentally responsible conditions, the Millennial Generation has developed a unique sense of global connectedness. Children who grew up in the 90s were the first to be exposed to the Internet and all of its global implications. While the world at large was struggling to redefine itself for globalization, Generation Y was an organic product of world-wide communication and interconnectedness. As a result of this exposure, Generation Y is extremely conscious of social impact and human relationships. Most members of the Millennial Generation highly value diversity and equality and are opposed, both as consumers and job seekers, to associating with companies that harm people directly or indirectly through labor abuse or environmental damage. Today’s young workforce seeks a socially and environmentally sustainable business model that will promote a synergetic and healthy global community. Students and recent college graduates who understand the relationship between natural resources and prosperity have a great advantage in the workplace as conscious members of the global community. The values of this younger workforce coincide with emerging trends and can only continue to shape the future of business and global society as a whole. With the ability to adapt to advancing technology and communications, this generation is primed for developing and restructuring the existing economy in order to promote sustainability and global economic health. For these young workers, and all members of the global community, a mantra has been adopted: “Think globally. Act locally.” The phrase empowers employees and employers to work together in attempts to alter and tailor business models that alleviate environmental strain and human suffering on a smaller, more applicable and relevant scale. The triple bottom line is the future of a sustainable global economy, but the direction of this global economy is in the hands of young workers across the planet. In America, at least, the generation appears primed and ready to lead the transition. Current business leaders can benefit by adopting these 3BL principles and relying on their younger workers for support and leadership. Kate Willson is an advocate of global education and educational equality. She writes for collegecrunch.org where she guides college students over the hurdles of academic and career life. Kate welcomes your feedback in the comments section.